moral (1) of the story....... Don't ask permission, in case they say no. ...... .just do it anyway. If caught (unlikely) plead ignorance and you will get a warning. moral (4) it is not hard to be cleverer than a government department. The personell in there are less motivated than you. Lots of people have come to the nursery and asked me what was the outcome. I ended up being prosecuted. I went to the District Court and defended myself. 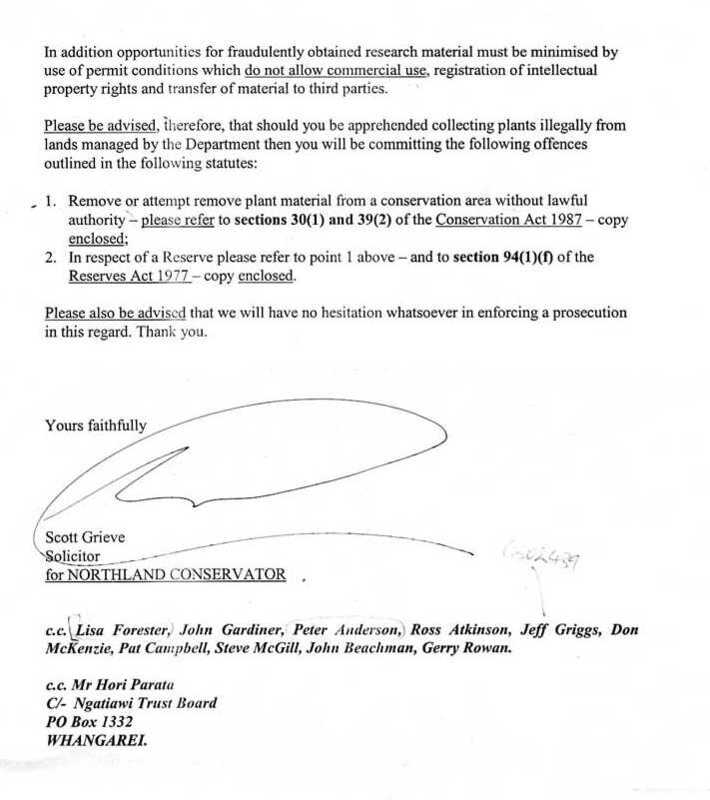 Part of my argument was that the Conservation Act 1987 , under which I was charged with the offence of collecting "plants", had been poorly drafted, and should have excluded seeds, as did the previous legislation, the Native Plant Protection Act. The courts insisted that seed were defined as plants as far as the act was concerned. I initiated proceedings for a Judicial Review into DOC's procedural errors in handling my seed collecting applications. 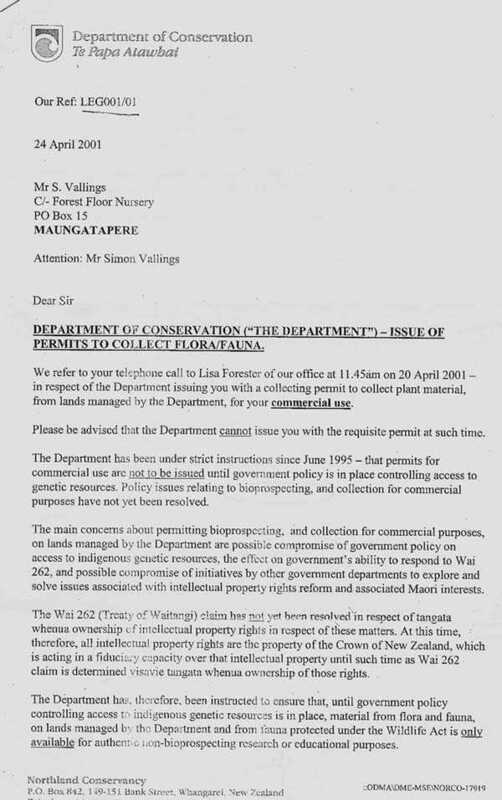 I attended the High Court several times only to be threatened with huge costs if I lost, so I promptly withdrew, pleaded guilty, offered DOC 1000 kauri trees to be considered as mitigation for my sentencing,which they said they had no use for and declined and I received a $650 fine. The maximum penalty for "taking plants" was 2 years jail so entitling me to trial by jury which perhaps I should have chosen, but I decided it would be a waste of taxpayers money. The seed I was collecting now goes to waste under the foot of DOC's mowers., or eaten by mice. None of them are able to germinate. They were from a seed orchard planted by members of the Forest Service, who grew many thousands of kauris, who propagated the seed orchard from the most trees that produced the most vigorous seedlings, for the purposes of providing future generations (us) with good seedlings to grow more kauri trees to replace all the ones that had been chopped down. The kauri trees in many places are dying from a disease called PTA. I think the answer is to grow more of them and to collect the seed off the most vigorous survivors and select for resistance to this disease. Only by having a genetically diverse population can any species evolve and survive, so we need acess to all the good stock. Since DOC have taken control of 33% of the country, including most of the remaining kauri forest, then they have a duty to ensure this resource is available to nurserymen such as myself to propagate from, in order to get vast forests of this magnificent tree growing. Its timber is of such a quality that it is considered amongst the world's top ten timber species. And Doc can't see the wood from the trees. They won't let me grow these seeds that are going to waste anyway. I continue to collect the seed. DOC just don't know about it. Except for some of the DOC field workers. The actual workers in the department are mostly really good people, many of whom have helped me to collect seed. Don't worry guys, I'm not mentioning any names here. I am directing my criticism at the higher level staff of DOC, the shiny shoe brigade who fly desks, not the field workers who are actually doing something. Exact details of what happened in my court case(s) will be posted here in the future.